Slightly north of Hudson Yards, along the West Side of Manhattan, a new community is being built adjacent to the Hudson River called Waterline Square. 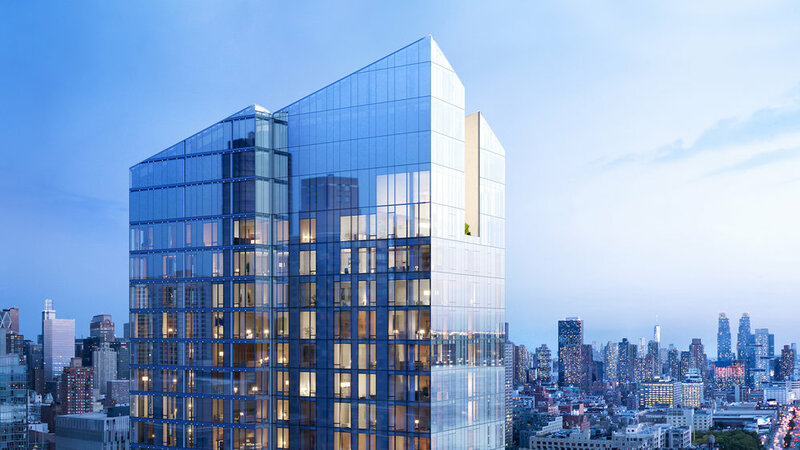 This new mega-project by GID Development will be located between 59th and 60th Streets on the cusp of the Upper West Side, and will be home to, among other things, three Starchitect-designed residential towers. We have written about the importance of Starchitects before, and with 3 iconic architects designing a project together, we anticipate Waterline Square to be a big game changer in the area! Waterline Square will be a complete waterfront community complete with residential living, amenities, and retail. The 3 residential towers will be positioned around a new 2.6-acre park. This lush park will feature cascading water features, a flowering meadow, and a fully equipped children’s playground. This new outdoor space will really be the anchor of the overall project. Residences of the towers will begin on floor 20 above, and all buildings will have access to The Waterline Club, a state of the art facility that will contain over 100,000 square feet of amenities. 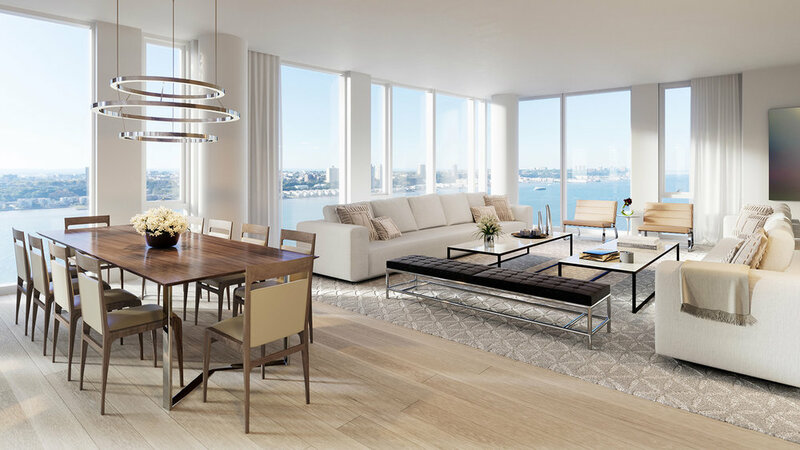 One Waterline Square is designed by Pritzker Prize winner Richard Meier and will take up an entire city block with a coveted waterfront location. 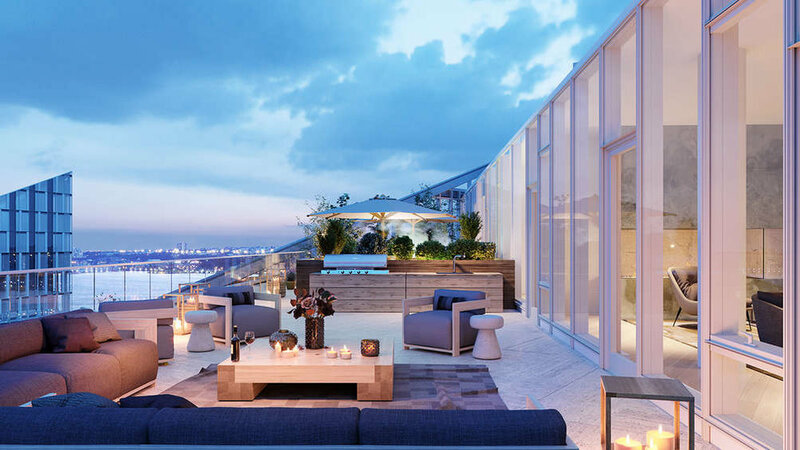 Residences of One Waterline Square will be graced with high ceilings, large banks of window offering homes amble light, and handpicked materials throughout. Champalimaud Design has been tasked with designing the interiors of One Waterline. The design studio has concepted some of the most luxurious interiors around the world from private residences to hotels. Kitchens will be done in the finest materials while master baths will feature book-matched marble slabs. In addition to the Waterline Club, residents will have access to a private suite of amenities for the tower also designed by Champalimaud. Yabu Pushelberg will be spearheading interior design at Two Waterline Square. The firm has over 35 years of experience designing interiors throughout the world. For this project, homes are designed around the floor-to-ceiling windows that allow the homes to take advantage of the building’s waterfront setting. Yabu Pushelberg has selected natural materials to use throughout such as kitchens done in chic and modern white marble with warm wood accents and white lacquer cabinets. The architect behind 432 Park Avenue, a building that captivated the world, is bring a design to Waterline Square. His building, Three Waterline, will be characterized by a diamond crown design atop the building. Residences are characterized by corners and gently sloping exterior walls that aim to capitalize on views in every direction. The building will face directly onto the newly built park at the base, offering residents a Park arrival into the stunning lobby. Groves & Co. will be leading interior design at Three Waterline, bringing a sleek and timeless sophistication to the homes. Residences will feature open kitchens with warm wood selections and elegant stone, with that elegant stone carried throughout bathrooms. The building will also have a suite of private amenities designed by Groves & Co. Amenities have been a big differentiator among luxury properties in New York, especially in a competitive New Development market. The offering at Waterline Square will take amenities to a level we have not seen before. In fact, the list is much too lengthy to even list everything out! The Waterline Club will be the home to amenities, a 100,000 square foot facilities with a grand hall at the center, and specific spaces for sports, fitness, social, swim, spa, creative, children’s, and pets. Waterline Square will also be home to the first ever combined food hall, market, restaurant, and bar experience by Cipriani. Prices start around $2M with a 20-year tax abatement anticipated. If you are interested in this project or other new developments, contact us for more info and your private tour.